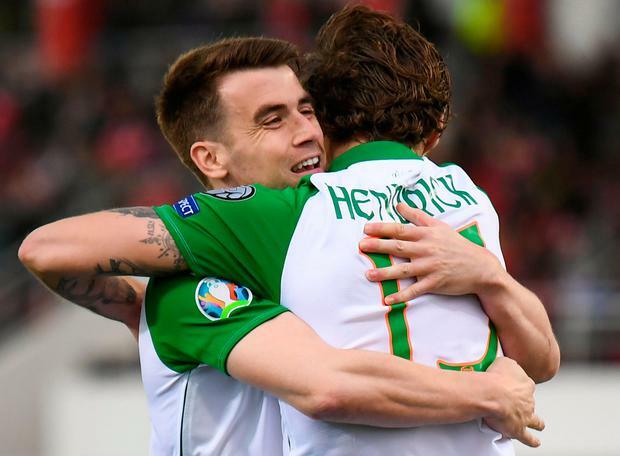 Seamus Coleman's 50th appearance for Ireland won't live long in the memory but the three points garnered this evening in Gibraltar could be crucial on the road to Euro 2020. Hendrick's first international goal since September 2016 ultimately settled a tight encounter fought out on a plastic pitch in swirling winds at the Victoria Stadium in front of the man who famously took the nation to the 2002 World Cup finals. However, they left having banked three Group D points, the minimum requirement heading into Tuesday night's clash with fast-improving Georgia at the Aviva Stadium. The lack of inspiration which plagued the latter days of Martin O'Neill's reign remains an issue, and although the difficult conditions had a part to play, McCarthy knows it is a failing which must be addressed if his team are to qualify for the finals. For captain Coleman it was all about the points. He heaped praise on Darren Randolph for a second half save that would have resulted in an embarrassing draw. "That was a world class save, I turned around I was fully expecting it to hit the net. How he's got his hand to it and tipped it around the post, that's Daz all over it was the same in the last campaign. He's a top class keeper and we needed him tonight." "Georgia are a very good team, they keep the ball well but we are going back to our stadium and our fans. We need to use the pitch and keep the ball. We're really looking forward to it, all games are tough in international football. It's getting harder and harder." Hendrick was glad to end his long wait for a second international goal especially after being urged to be more offensive by the management team. "It was nice to get the goal and they have been on to me all week about getting in the box, using my presence and getting on the end of balls. I tried to do it today and thankfully I got the goal," he said. "It was difficult, the ball was a bit slow (on the surface) and I think we can play a lot better than that but we've got to take the positives out of it, we ground out a result, we've got plenty of games to come and we're only getting started." Striker David McGoldrick told Sky Sports: "They were tough conditions but the main thing was to get the three points. We should have done better. We had some chances." Of Hendrick's goal, he added: "We wanted to get in behind them and we did. We've been working on the midfielders getting into the box and it's a great run from Jeff."